What Does Watermelon Have To Do With Black History? Many ethnic groups enjoy the sweet juicy red flesh of watermelon; including blacks and not every black person eats watermelon. In fact, black people only makeup about 13% of the United States population, but accounted for only 11% of the countries watermelon consumption according to a USDA study. During slavery and after, free black people grew, ate, and sold watermelons to each other and whites. The fruit became a symbol of their freedom and independence. They most certainly were not ashamed of it. Watermelon helped form an economical platform for free blacks; no shame in that! But, what made blacks so successful at growing watermelon? If you thought that white slave masters taught blacks how to grow watermelon, you're wrong! Truth is it was those early African slaves who taught Europeans how to cultivate watermelon because it was brought to the Americas by them during the Atlantic Slave-Trade. The watermelon itself is originally native to the African continent. The fruit has been widely cultivated by Africans since ancient times up to this very day; growing all over western and southern Africa; even stretching as far as northeastern Africa. 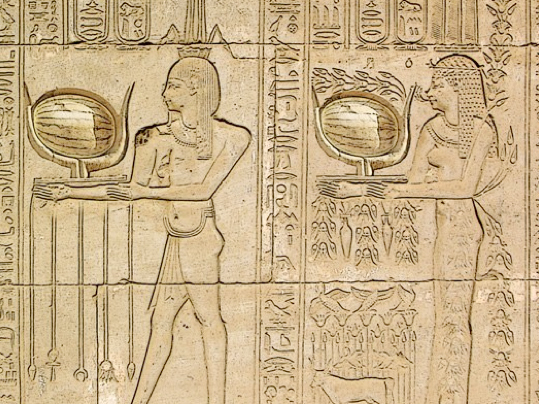 Africans have been eating watermelon for thousands of years. Archaeologists have found watermelon seeds at an ancient settlement in Libya dating back 5,000 years ago. 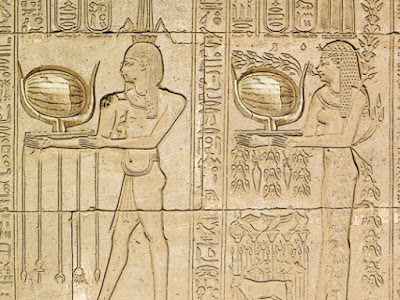 In ancient Egypt, the watermelon was not only a widely cultivated food, but it also was considered to be the fruit of the gods. 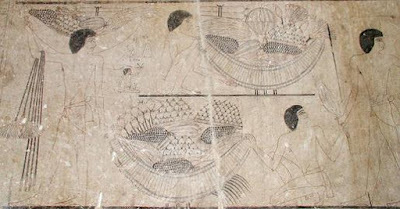 Seeds and hieroglyphic paintings depicting watermelons being offered to Egyptian gods have been found in tombs built more than 4,000 years ago, including King Tut’s. Watermelon was also found in the tomb of Egyptian high priest Nebseni. Legend has it, that the watermelon didn't get a bad rep until some unnamed British officer stationed in Egypt in 1801 referred to it as “a poor Arab’s feast,” and a "meager substitute for a proper meal". But, who cares what this bitter passerby has to say! Watermelon's rep is devoid of opinion and speaks for itself. Truth is the early modern Europeans associated watermelon with the people who mostly ate them; which were Italians and Arabs who they perceived as peasants. 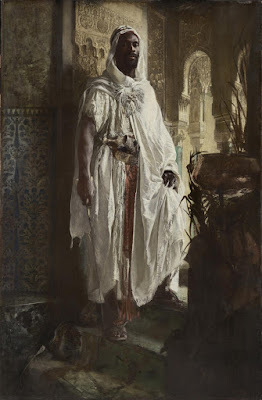 The reason being is because 8th century southern Europe was conquered by black African Arabs and Berbers called the Moors. Blacks ruled that part of Europe for over 700 years and they brought watermelon with them as well as civilization. Forget "50 Shades of Grey", try "700 Years of Black". Although Moorish rule ended in 1492, it is not uncommon for prejudice of a group of people to be passed down through generations. Take racism in America for example. Slavery ended in 1865, but racism is still ripe. So in that sense, the Europeans who were still bitter about being ruled by blacks had a lot in common with the bitter American white slavers after the Civil War; which ended slavery. What's unfortunate though, is how the watermelon keeps getting put in the middle of all of this mess. Is it possible to hate a group of people so much you hate what they eat too? Contrary to what this 19th-century British soldier said, watermelon is far from a meager diet. Watermelons are about 92 percent water; a substance we can't survive without. It also has significant levels of vitamins A, B6, C, and is rich with antioxidants and amino acids. Watermelon contains potassium, it's fat-free, low in sodium with only 40 calories per cup. Watermelons are among the fruit with the highest amounts of lycopene; a phytonutrient known to block UV rays, strengthening the skin's melanin, and increasing its elasticity. Lycopene is a key nutrient for healthy juvenile skin and slowing down the effects of aging. If you've heard the phrase "Black Don't Crack", fruits like watermelon help make that statement true. Watermelon can be eaten as both fruit and vegetable. Once the fruit is removed, the rind can be used in salads; as it tastes very similar to cucumber. With all of this deep history joining watermelon and blacks together, stereotypical slurs from American slavery are both ignorant and irrelevant. If you're a black person reading this, whether you eat watermelon or not it was used as a commodity in the early black community.